A few weeks ago, there was ANOTHER Chinese holiday (it constantly feels like it’s party time/holiYAYs at the moment) and I met up with Mae from Craft’d Shanghai at their new little studio just off Fuxing Lu here in Shanghai for an Espadrille Workshop… and as they’d had a few last minute cancellations, I was the only one for the morning session! So luckily Mae wasn’t shy at telling stories, so we spent the time making and chatting about our lives in Shanghai and before we came here. So the SHOES! They are MUCH easier to make than I’d imagined.. and really quick to make them… as the actual template/pattern is quite small and the sewing part is very minimal… the time is in the stitching it all together. 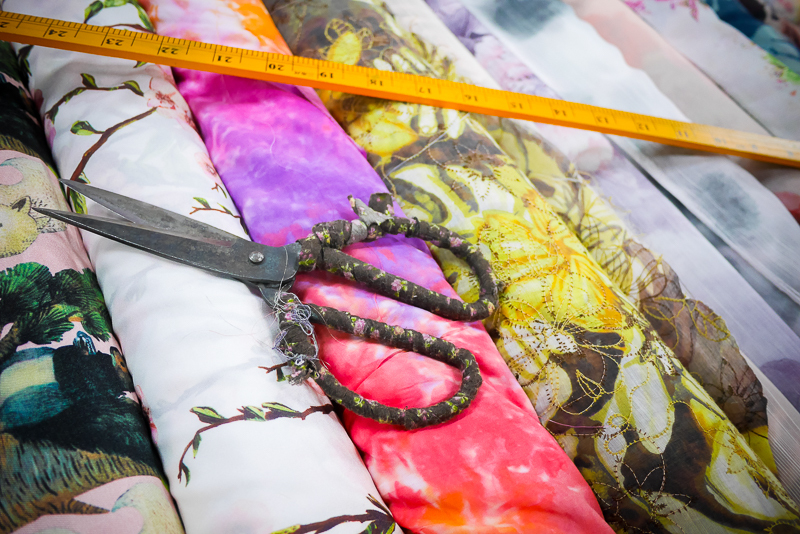 And for me, taking the time to choose the fabric… oh the agony of choosing from someone else’s stash! 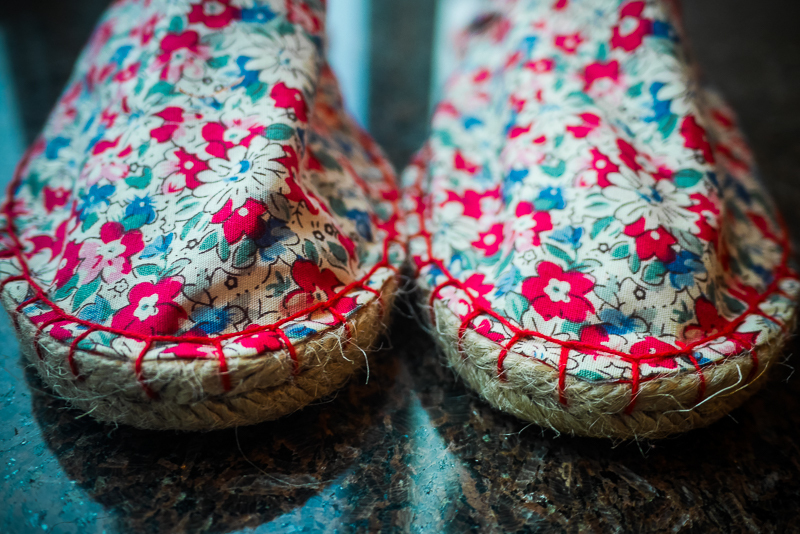 Craft’d is very equipped with all the woven for this kind of shoe, so I wanted a two tone but once I decided on red for the main colour there were about 10 different options to make up… so settled on floral and stripe inside. 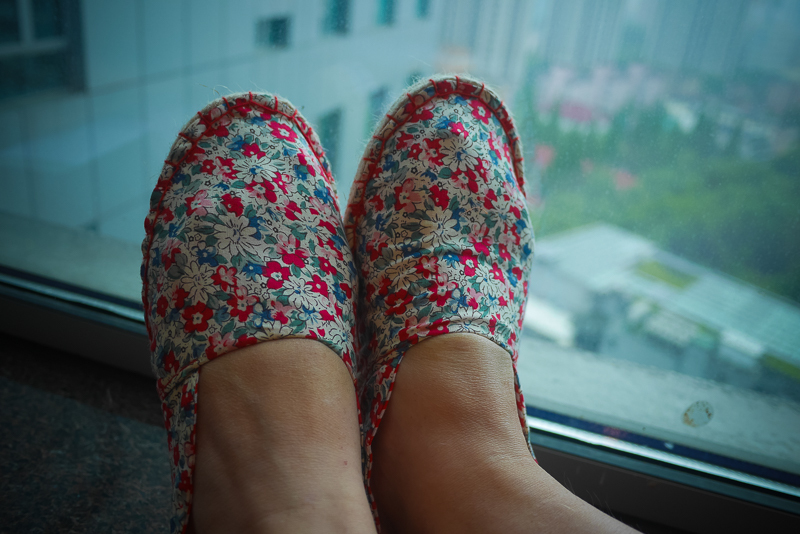 I’ll write up a blog post soon about Craft’d Shanghai and their workshops… but I had such an enjoyable morning taking my time with these shoes. It’s so great to chat and craft. Like I mentioned the red stitching is the most time consuming and you also want to get it very neat because it can look unbalanced really quickly if you rush it… I have no idea what the stitch is called…. but you rely on tension a fair bit as you push the needle and thread through the sole of the shoe and then make sure you have the top stitch in place … um, it’s hard for me to explain without holding the shoes & thread! It was great to make something so neat though, so very happy I didn’t rush them! 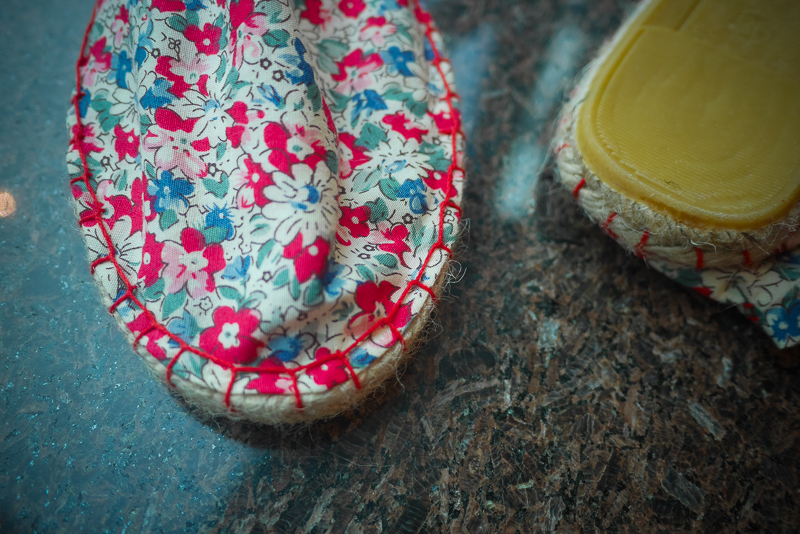 While it was super fun to make some shoes, once I’d made the second one up at home (the workshop allows enough time for the first shoe… but you do the second at home… unless you’re a stitching whizz! ), I don’t think they’re the kind of shoes I wear. 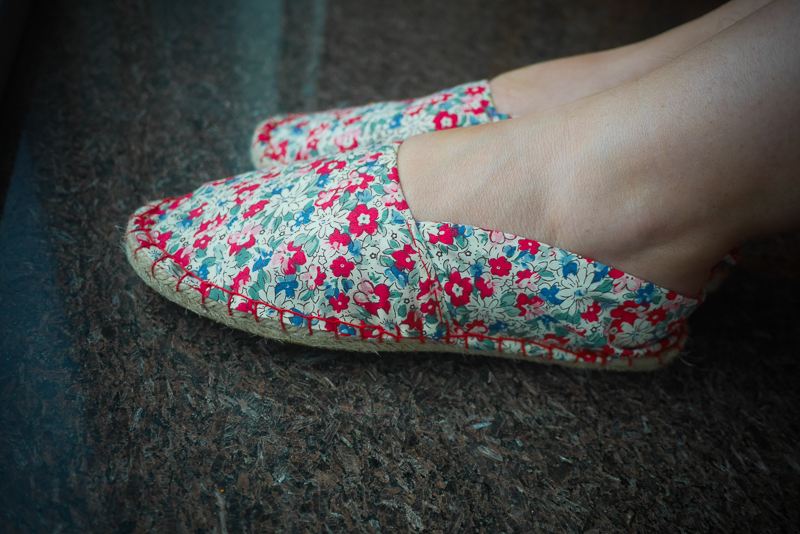 They feel like slippers to me… and are still a bit gapey at the back even with some darts at the heels. 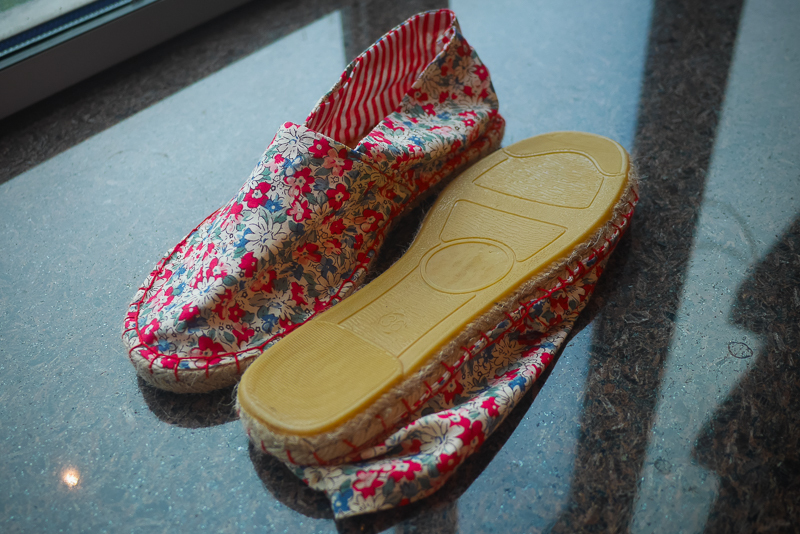 I’ll deffo use these around the house (because we all wear slippers inside all the time!) 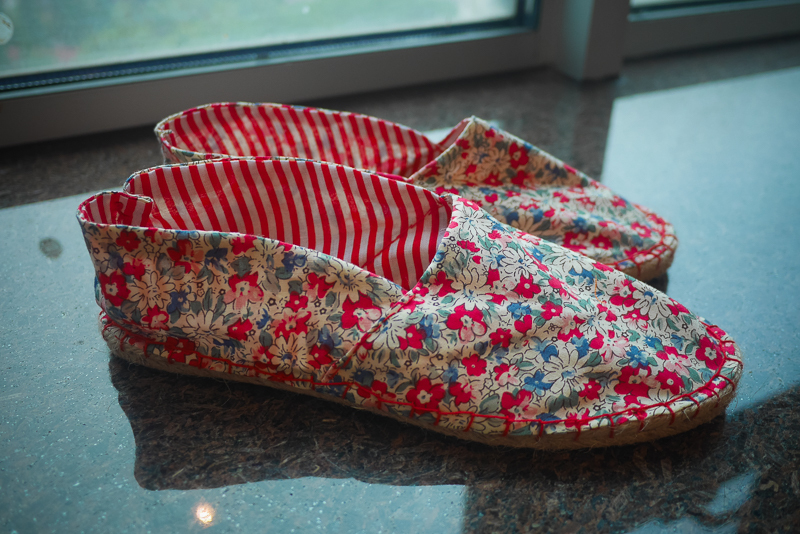 and may even use them as my special sewing slippers when I start sewing classes again. 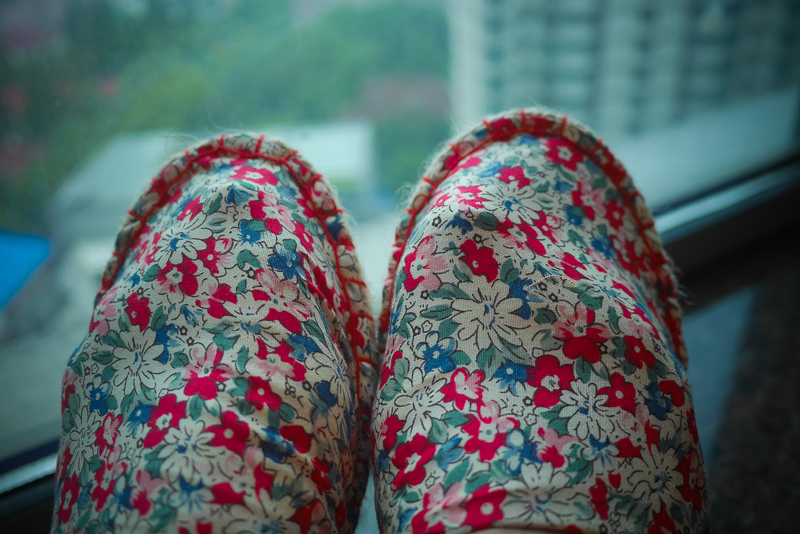 BYO slippers!